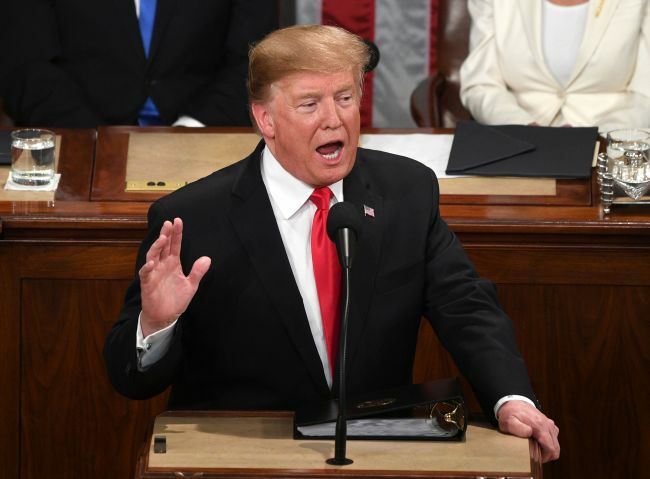 Trump said that much work remains to be done in his state-of-union address. “As part of a bold new diplomacy, we continue our historic push for peace on the Korean Peninsula,” he said during the speech, which focused on the country’s foreign policy and economic status. Trump highlighted his achievements in ongoing nuclear diplomacy with North Korea. “Our hostages have come home, nuclear testing has stopped, and there has not been a missile launch in more than 15 months,” he said. His remarks come as Trump and Kim are expected to discuss a concrete plan for how the North will implement steps to give up its nuclear weapons program and what the US will offer as incentives to encourage such actions. South Korea’s presidential office Cheong Wa Dae welcomed Trump’s official announcement on the two-day summit. “The two leaders have taken their first step to clear out 70 years of hostile relations in Singapore. We expect that they will take more detailed and substantial steps of progress in Vietnam,” presidential spokesman Kim Eui-kyeom said. A series of working-level talks aimed at preparing for the upcoming summit has been held between the two countries in recent weeks. Biegun and his counterpart Kim Huok-chol have met each other before. Kim accompanied North Korea’s top nuclear negotiator Kim Yong-chol when he visited Washington on Jan. 18 for talks with US Secretary of State Mike Pompeo. Before heading to the North Korean capital, Biegun, who arrived in Seoul on Sunday, met with national security adviser Chung Eui-yong at Cheong Wa Dae on Monday. During the 40-minute meeting, Chung and Biegun exchanged views on what Seoul and Washington have to do together going forward, ahead of working-level talks between the US and the North. The US envoy also met with Lee Do-hoon, special representative for Korean Peninsula peace and security affairs. As US-North Korea talks were revived in January following slow progress since their Singapore summit, concessions from the two sides that will bring denuclearization negotiations to the next level have been drawing keen attention from the international community. On Jan. 31, Biegun said the North Korean leader has committed to “the dismantlement and destruction of North Korea’s plutonium and uranium enrichment facilities,” in a speech at Stanford University. The North has been demanding the US lift economic sanctions, as it halted nuclear and missile tests, dismantled its nuclear test site and parts of its rocket launch facility and released US detainees in 2018. Sanctions imposed by the United Nations and the US have struck a major blow to North Korea’s economy by limiting exports, leading to a sharp drop in the nation’s foreign currency reserves, which enable the country to import essential products. Experts say that North Korea will likely seek to offer the demolition of its Yongbyon Nuclear Scientific Research Center — North Korea’s major nuclear site that houses a uranium enrichment facility and reactors — in exchange for a US promise to formally declare an end to the 1950-53 Korean War and to open a liaison office in Pyongyang. “If the US hopes to reach an agreement, a denuclearization road map that goes beyond the Yongbyon nuclear complex, it needs to show more flexibility in sanctions relief for the North’s active engagement in making progress in denuclearization measures,” said Cheong Seong-Chang, a senior researcher at the Sejong Institute.